Here is a refresher on general treatment modalities used for epicondylitis so you are better prepared to answer your avid golfer and tennis patient’s questions. I am lucky enough to work along side Lenox Hill NISMAT (Nicholas institute of sports medicine) physicians who are esteemed in treating sports related injuries so many times I have the opportunity to discuss patient cases in person which helps pain a better picture of the physicians medical management for epicondylitis. One of the commonly performed tests that helps to diagnose lateral epicondylitis is maudleys test also known as the middle finger sign. The test is performed by having the patient resist into extension manually added resistance toward flexion of the 3rd digit. A positive finding is pain elicited around the lateral epicondyle or proximal wrist extensors. This is a great test to add into special testing and is a good way to Segway into educating the patient on the mechanisms behind lateral epicondylitis. For additional details on the pathophysiology behind epicondylitis I highly recommend reading the latest sports and health journal which talks about the disease process at the cellular level and helps differentiate the acute stage of the inflammatory process through the stages of tendinosis. I find patient education to be one of the most important factors since epicondylitis in my experience is often a repetitive strain/overuse type of injury. Here are some of main points I emphasize to my patients and try and drill in every time I see them. Avoid the death grip when exercising or performing their activity. Improve proper mechanics with a professional or seasoned veteran. Many times amateur athletes tend to neglect using the entire body especially transferring their energy and power from their lower kinetic chain upwards. Video analysis with the use of programs like dart fish or even simple tablet and smartphone based applications can show faults in ones mechanics. A great simple and easy to use program that I use is SloPro for iOS which automatically slows down the video. It is important to have an open discussion with your patient about modifying their activity. Resistance weight training which is not apart of the Physical Therapy therapeutic exercise regimen should be modified so that symptoms are not worsened especially in the early stages. This is usually a good time to discuss options of performing more cardio. Exercises such as pull-ups and push-ups tend to stress the elbow joint more and should be avoided early on. Prioritize activity! If the patient loves to play golf and occasional tennis, make sure that they put the occasional tennis on hold until symptoms are better managed. This may seem like common sense but people need to be reminded to keep priorities straight especially with their body since you only have one. Perform ice massage after activity! We all know the importance of eccentric based exercise especially to promote tendon healing. Perhaps one of the best eccentric based exercise for lateral epicondylitis is the Tyler twist. I am lucky enough to have learned these exercises first hand from Tim Tyler himself. 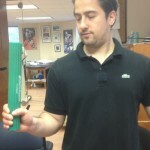 Here below are some pictures of myself on how to correctly perform the Tyler Twist for lateral epicondylitis. 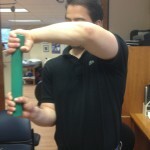 Step 2: Starting position for exercise grasping thera-bar with involved arm. 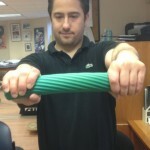 Step 3: Keep both wrists steady extending both elbows and keeping shoulders at or just below 90 degrees of flexion. 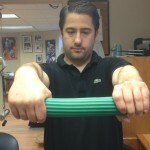 Step 4: Eccentric wrist extensors fired with involved wrist going towards flexion. Key points from my personal experiences to keep in mind when instructing this to the patient. Make sure wrist stays extended before performing slow eccentric activity of the forearm extensors toward flexion with Tyler Twist exercise. This blog post is intended to be anecdotal evidence and discussion for Licensed Physical Therapist’s leisurely reading enjoyment. The above information is not intended to be used as treatment guidelines but rather One Physical Therapist sharing his personal experience.